Design: Automatic setting to various conductor diameters. Settable length stop from 5 -12 mm, can be removed if required. Integrated, easily accessible wire cutter. 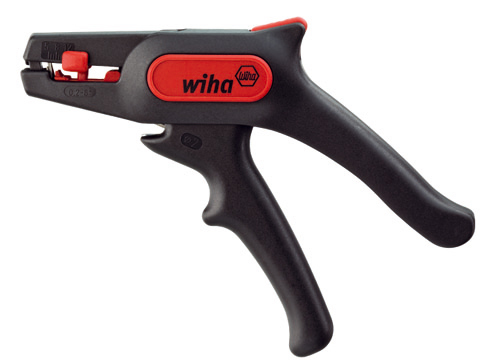 Light, ergonomically designed tool body with narrow head for optimal use in hard-to-reach areas. Locking for safe, space-saving transport. Material: Housing of glass-fibre reinforced polyamide. Application: Stripping of all commonly used flexible and solid conductors from 0.2 – 6.0 mm² (24 - 10 AWG). Wire cutter for cutting of Cu and Al conductors to max. Ø2 mm. Design: Double layered, folding stripping tool with opening spring and locking mechanism. Setting of cutting depth not required. Extra-long tool body for optimal handling. With 5.0 - 20.0 mm length scale. Application: Incremental stripping of all commonly used coaxial cables (e.g. antenna and transmission cables) from 4.8 – 7.5 mm outer diameter. Also suitable for stripping of round cables (e.g. NYM 3 x 0.75 mm², PVC flex 10 mm² and 16mm²). Design: Double layered, folding stripping tool with opening spring and locking mechanism. Setting of cutting depth not required. Ergonomically designed tool body for non-slip, safe work. Application: Flush stripping of round and damp-proof cable from Ø 8 – 13 mm (e.g. NYM 3 x 1.5 mm² to 5 x 2.5 mm²), also for hard-to-reach locations e.g. ceiling and wall areas, in junction boxes, distribution boxes, switch cabinets etc. Design: Comfortable stripping with continuously adjustable cutting depth per adjusting screw and self-turning inner cutter. Damage to the inner conductor is therefore eliminated. Self-tensioning holding lever for safe cable guide. With cutter and hooked blade incl. safety cap for transport and storage. Additional spare blades included in the tool. Ergonomically designed construction. Material: Impact resistant plastic housing made of Polyamide reinforced with glass-fibre. Hooked blade and cutter are made of hardened steel. Application: Precise, fast and safe stripping of all common round cable from ø 4 mm – 28 mm. Self-turning inner cutter for circular and longitudinal cutting.